Sharjah Art Foundation (SAF) presents Ilya and Emilia Kabakov: A Collective Memory, an exhibition that traces the life and work of Ilya and Emilia Kabakov. American artists born in the Soviet Union, their work fuses elements of the everyday with those of the conceptual. While often rooted in the Soviet social and cultural context in which they lived, their work attains a universal significance that contemplates failed utopias around the world. Works in the exhibition include a series of paintings from ‘Four Paintings About Freedom’, Suprematist Painting which turn out great, With my respect to my Teacher Charles Rosenthal, as well as two installations: Memorial to Useless Things and The Blue Carpet. 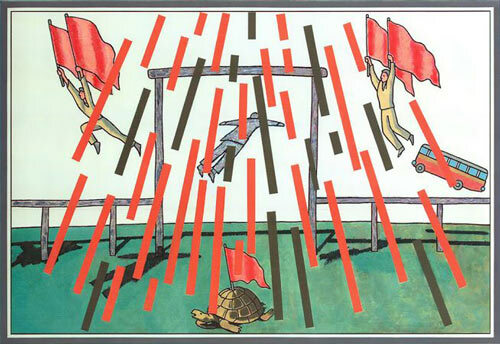 Whilst describing Memorial to Useless Things, Ilya and Emilia Kabakov stated: “…because they are useless for whom? For somebody else. They always hold memories, and everything that is useless for somebody is always useful for another person. It is a memory, its part of your life. Nothing is useless in reality. We have another memorial, Memorial to Unknown People, so that’s from the same category. It is a very deep idea of the memory because a huge monument is a memory of the society, of history now.